If you're a horse owner, you probably realize the importance of maintaining your horse trailer. Make sure the trailer's exterior is clean and sanitary. Not only does this ensure a respectable appearance, but it also eliminates rust and old paint that can be dangerous for you or your horse. So it's wise to paint (or repaint) your trailer periodically. Lay out a tarp under the trailer. You want the area where you paint to be clean afterward. Apply rust remover to the trailer's surface. Sand the trailer, giving it a smooth surface. Remove loose pieces of remaining rust and old paint by rubbing it with sandpaper. Cover the edges of the window with painters tape to avoid painting the windows. Use your paint roller to cover the large surfaces of the trailer with primer, and then use the half-inch paintbrush to prime smaller surfaces and corners. Allow the primer to dry. 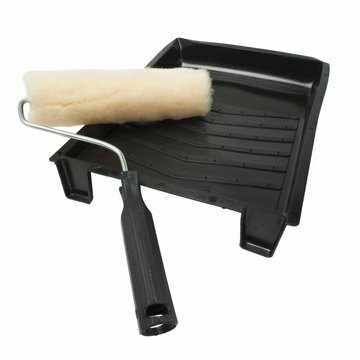 Clean the primer from your brush. Use lukewarm water or paint remover. Brush a light first coat of paint over the entire trailer. When the first coat is dry, apply a second coat of paint. Then apply a third coat. If you're maintaining your horse trailer for the sake of appearance rather than for health reasons, you may only need to buff out the existing paint with cleaning wax. If you do paint, be aware that the color of your primer may affect the final appearance of the trailer. The best choice is a gray primer. Some paint, such as acrylic enamel, can be toxic if you inhale too many fumes. Wear a mask over your nose and mouth to prevent this. Davis, Skip. "How to Paint a Horse Trailer." , https://legalbeagle.com/how-5764241-paint-horse-trailer.html. 09 January 2018. What Is Included in a Bumper to Bumper Warranty?